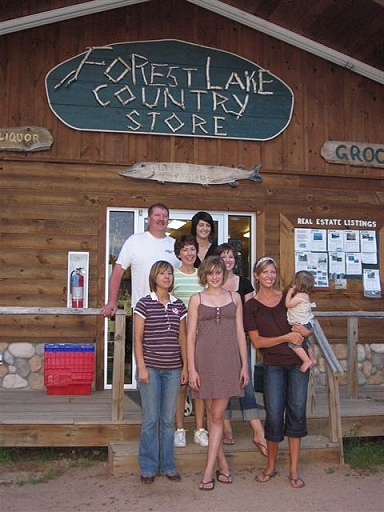 Kris and Mark Gostisha are the proprietors of the Forest Lake Country Store. Transplanted from Port Washington, Wisconsin in June of 2006, Land O' Lakes has always been a part of their life. They honeymooned here in 1979, vacationed in the area as they raised their five daughters and now live in Land O' Lakes with their three youngest children. Kris brings 15 years restaurant experience and Mark has over 20 years experience in sales and marketing. Their combined skill allowed them to live their dream to be up north and own their own business. The goal was to own the kind of place they would take their own kids. It is evident they succeeded at the Country Store. Casual atmosphere, non-smoking environment, and prices that a family can afford make it a great spot to visit. The best thing you will find at the Country Store is friendship. You may meet a friend here, or make a friend here, but you will always find that friendship abounds at the Country Store.